Isn't it funny how the brain works? Not hah-hah funny, but amazing funny. Sometimes we have a sudden flash-back to some other time in our lives...it might be triggered by a sound, or maybe a smell...it could be any one of our five senses that brings back a memory, either wanted, or unwanted. My wife and I had an experience this past weekend that brought this home to us. But, it wasn't related directly to a triggering from one of our five senses. So, what was it? It was a wine, of all things. It was a wine which we brought back from a trip to Italy in 2014. And it was this wine that brought back memories. And those memories brought back a joy of Italy and a wonderful day in Tuscany. This is a story about stopping to smell the roses...or if you are want for roses...the wine. First, I'll give you the backstory for the experience which uplifted our spirits this past weekend. Our memory started as many Italian memories do -- with food. We had just finished an outstanding lunch at Ristorante La Botte di Bacco (The Bottle of Bacchus) in the hillside town of Radda in Chianti. This charming little restaurant is highly regarded by those who utilize TripAdvisor in their travels, as we do. The upstairs dining room overlooks the street and the surrounding valley below the town. That's our table in the photo at left. The food is absolutely scrumptious. I have included a few photos below to prove this statement. As we sat down at our nice window seat, we enjoyed the Tuscan countryside on this temporarily-beautiful day. See the photo to the right? When we sat, I'm like, 'Whoa...what is this?!' My wife Ellen, being an expert in such things, let me know that, 'It's like a ginormous bread stick'. And I'm like, "Man, its good!" I've never lied to you, and I won't start now as I tell you that I am now a fan of huge bread sticks. And, in the photo to the right, you can see that Ellen has quickly become a huge fan of fried pizza dough that we found in the carb-alicious basket of goodies you see below. And here are a few photos of just some of our lunchtime treats. 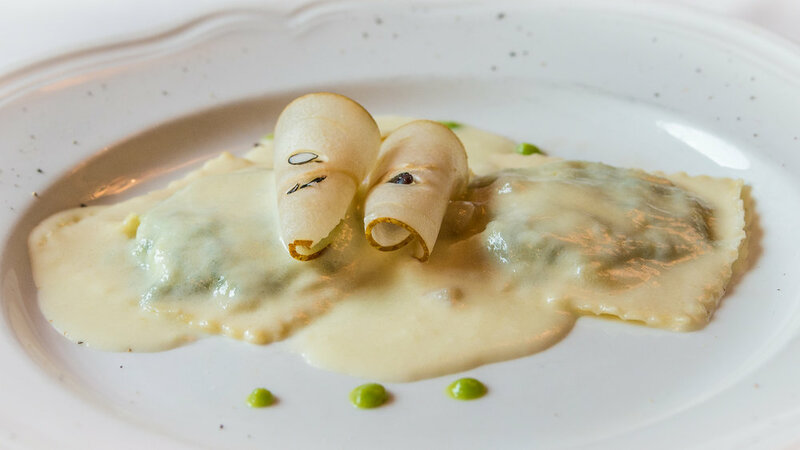 Please click on the images, because I want you to get a much closer look at the shaved pear and ravioli, the veal, and the bisteca con carciofo (aka artichoke). Benissimo! The white wine above? I don't remember what it was, but it was delicious, as you can tell by the smile on my face, below. But, this is not the wine of which I write today. You can see the wine of which I write today in the next photo...but though it is, it also isn't. That probably doesn't make much sense, does it? So read on. The red wine in the photo is a Chianti Classico from the Rocca di Castagnoli winery. See the black rooster on the neck of the bottle? That tells you that the wine is officially a 'Chianti Classico' wine. Chianti Classico does not in itself impart a note of superiority, but is more related to a location. The Chianti wine region is generally a Tuscan area south of Florence, and the Sangiovese grape variety grown there is the key ingredient of all Chianti. And if the Chianti region was thought to be shaped as a donut, the Chianti Classico area could be the hole in the Chianti donut. The town of Radda in Chianti, where we were eating, is located in the Chianti Classico area. You can see that the wine is a 2011 wine, which in summer of 2014 was just right for drinking...it was approachable, as one might say...so, we approached it. If you are want to know more about Chianti Classico and it's origins, please read my article of August 25, 2015, about the birthplace of Chianti titled, "Beautiful Places Castello Brolio". During lunch, the formerly sunny day turned dark and stormy, as you can see below as we looked out of our window-side table. 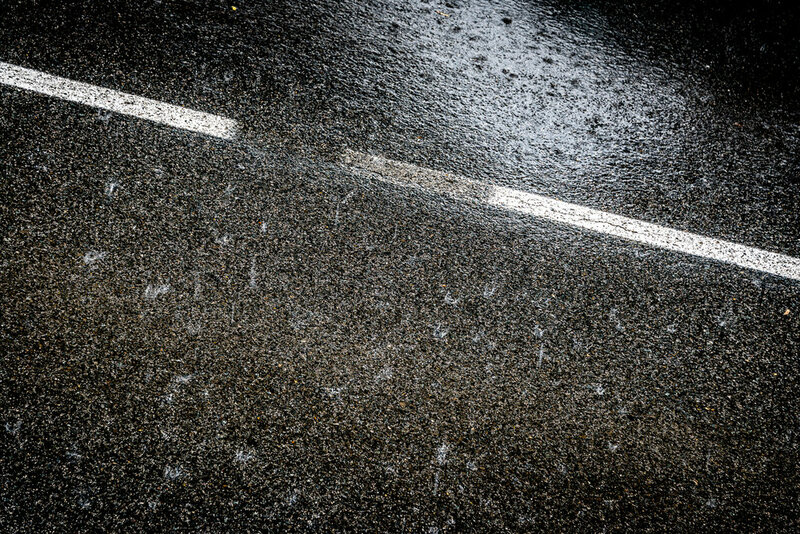 So after lunch, we darted from one dry spot to another as we made our way to our car. We took shelter in a couple of tourist stores, then a butcher shop, and in the tunnel-like entrance to this centuries-old courtyard. 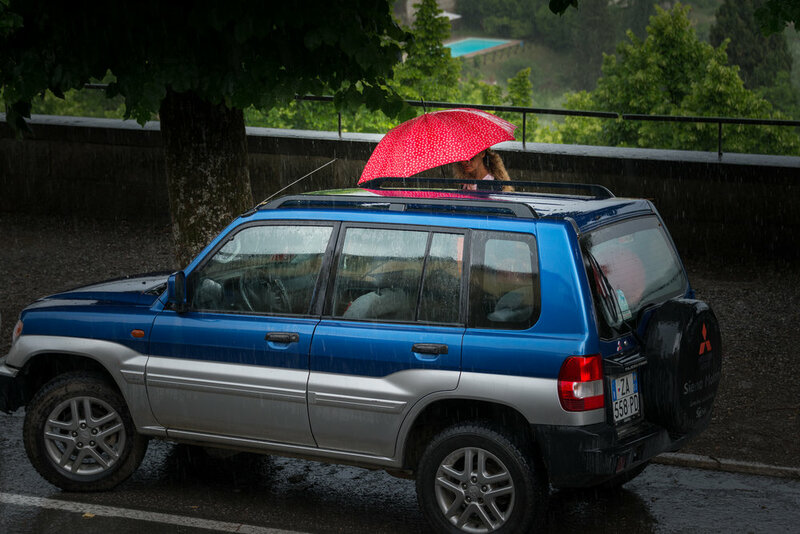 Having dodged rain drops, we made it to our rented Alfa Romeo Giulia, where we sat for a bit. Ellen offered, "That Chianti at lunch was really, really good. Let's see where it's made and go visit the winery." Sounded good to me. So, that's what we did. We took a bit of a circuitous route, for which we were rewarded. You might remember an article I wrote back in June, 2015, which was titled "Get Lost!". If you don't remember that article, you can read it here...it's one of my favorites. Our reward for taking this route to the Rocca di Castagnoli winery was beautiful scenery as the weather began to clear. Here is one of my very favorite photos of Tuscany...full of rich, weather-lifting scenery, as well as rich memories. And a couple more photos from along the way in the 'moody weather' vein. The Rocca di Castagnoli winery sits high upon a hill southeast of Radda in Chianti. Like a lot of wineries in Tuscany, it is housed in centuries-old buildings. During our tour of the winery, we particularly enjoyed the barrel-vaulted barrel vault, with row-after-row of colorfully casked wine, aging to perfection. Want larger casks? You got it! In the photo of the lone cask to the right, you can see the burned-in graphics indicating that it is an oak barrel from a particular forest. You can also see that it is made from grapes of the 2013 vintage. Here's the very friendly young man who helped us in tasting the various wines behind the Rocca di Castagnoli label. And here, he has laid out several wines for us to try. We had a great afternoon indoors tasting delicious wines, while outside it was off-and-on stormy. Know what we did when we left? That is the subject of another of my very favorite articles titled, "Wild Goose Chase", which is about our ill-fated reservation at one of Tuscany's (formerly) finest restaurants. You can reminisce with us by reading here. Just a quick note about wine tasting and driving. If you haven't tasted wine at an enoteca, or Italian winery tasting room, please understand that you don't get a full pour, nor even a half pour...a taste is all you get...just a sip. So, inebriation shouldn't be in the picture. And just a bit more about drinking in Italy...as our friend Luciano says, "If you see a man who is staggering down the street after having too much wine, we say that he just hasn't had enough to eat!". Such words of encouragement for eating more in Italy are not needed...really. So finally, now back to my story about this past weekend, and the gist of this article on enjoying Italy-bought wine. That is the whole point, after all. To fully understand today's story, you have to understand that we were naughty this past weekend. Yes, we were very naughty! So, there's all kinds of naughty, right? And I'm not sure what degree of naughty you are imagining right now (but of course, you can use the Comment box below to share your thoughts if you feel so obliged), but I have to say that our naughty was in the really-tame-naughty category...mostly. This past weekend, we had planned to clean up the house. Besides the various misplaced items on our main floor, we had things in our bedroom which we had neglected for awhile, and in our basement (please don't tell anyone this! ), we had not put away all of our boxes of Christmas decorations. I know...we are terrible people, aren't we?! Instead of starting the ball rolling Saturday morning, I completely stopped the ball by suggesting that our day would be better spent laying around in our jammies in front of the fireplace reading our books and drinking wine. With hardly any sales effort on my part, Ellen bought into my program with absolutely no hesitation. So, that's exactly what we did. I got the fire going (yes, we actually use wood in our fireplace!) and then went down to the basement (aka wine cellar) to grab a bottle of red wine. While Ellen lay on the couch reading in front of the crackling fire, I uncorked the bottle and poured us each a glass. Ellen: "Dang! What is this? It's really, really good!" Me: "Let me look. Its a bottle of Chianti Classico from Rocca di Castagnoli." Ellen: "Isn't that the wine we bought that day when it was raining after we had lunch in Radda in Chianti?" Me: "Yes, that's exactly what it is! Let's pull up the photos from that trip so we can look at 'em." So, that's what we did...and we were able to journey back to relive almost every moment of that wonderful afternoon. It was all brought back by enjoying our Italy-bought wine from our 2014 trip. And, we were pleasantly surprised to see that it is the exact same wine - vintage and all - that we had for lunch that day at La Botte di Bacco. And with the added 2 1/2 years of aging, the wine was even better than before than before...markedly better, actually. ...Ellen reading her 'book' with wine in hand..
...and I with my wine as I finish reading "Somewhere South of Tuscany", written by our lovely friend, Diana Armstrong (see my article "Covering for My Friends"). We had no roses this past Saturday, but we stopped anyway, smelling the wine instead...and our week will be better for it. When you next travel to Italy, bring back a bottle of wine, and give this a try for yourself. Finally, on a photographic note, each of the final 4 photos above that were taken this past weekend were captured on my iPhone 7 using the new "Portrait" mode. This mode is meant for photographing people: rendering a person in sharp focus, whilst the background is blurred. I like the way it was able to accentuate the wine bottle tableau, Ellen's glass of wine, and my book. Give it a try if you have this new equipment.